Clandeboye Golf Club comprises of two distinct golf courses, The Dufferin Course is the Championship course, measuring 6,742 yards of the white tees with a Par of 71 and standard scratch of 72. 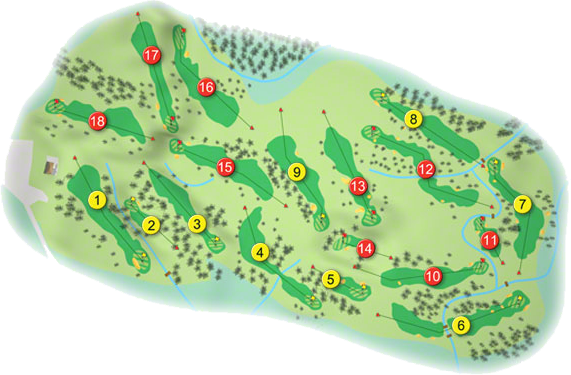 It has many fine challenging holes not least the 455 yard Par-4 8th index 3 and the tough finishing hole at 433 yards index 6. The Ava Course is somewhat shorter at 5,755 yards with a Par-70 and standard scratch of 71 off the white tees, is no pushover in particular the 524 yard 2nd index 1 is considered as on of the toughest Par-5’s to be encountered anywhere. 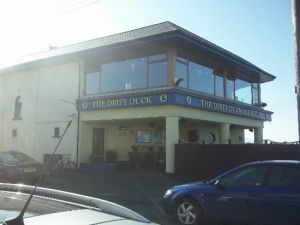 Situated on classic heartland on the hills above Conlig Village with breathtaking views of the Irish Sea and Belfast Lough. Clandeboye was the venue of one of the most valuable Ladies Tournaments staged anywhere in Europe. When in 1984 it staged the Smirnoff Irish Open with a prize fund of £100,000 and a first prize of £22,500 won by the Australian Jan Stephenson to record her 87th victory on tour. 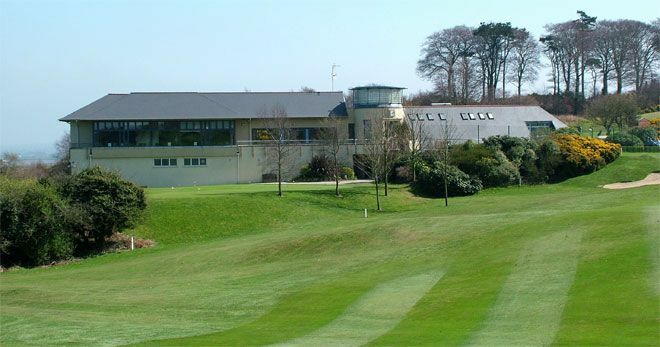 It was also the venue of the Irish Close Championship in 1998 won by Lillian Behan of the Curragh Golf Club. Clandeboye Golf Club won the Ulster Final of the Barton Shield when they beat Lurgan Golf Club by 1-hole at Belvoir Park Golf Club on Sunday 16th September 2018. They made the long journey to Thurles Golf Club and were drawn against Connaught Champions Athenry Golf Club on Thursday 4th October they were led out by William Russell with Karl Eccles who lost their match against Joe Bernie Jnr. with Louis O’Hara by 5-holes in the second match Graeme Laird with Scott Miller lost out by 2-holes against Darren Leufer with Allan Hill. Athenry went on the following day to win the green pennant against Dundalk Golf Club by 3-holes. Clandeboye Golf Club won the Ulster Final of the Barton Shield when they beat Warrenpoint Golf Club on the tie-hole at Shandon Park on Sunday 4th August 2013. They made the trip to Royal Tara Golf Club to participate in the National Deciders. They met Cork Golf Club in the All-Ireland Semi Final and recorded a 7-hole win over the Munster Champions. They were led by Greame Laird with Lee Crawford who halved their match against M. Flood with Ian O’Flynn next up was Colm Murphy with William Russell who had a wonderful 7-hole win over Gary O’Flaherty with John Hickey to book their place in the All-Ireland that afternoon. They met Connaught Champions Co. Sligo who had beaten Leinster Champions Rosslare Golf Club by 3-holes in their Semi-Final. They were led again by Greame Laird with Lee Crawford who suffered a 5-hole defeat against Sean Flanagan with Declan Reidy, but in the second match of 50-year old Colm Murphy and 19-year old William Russell against Gary McDermott with Steffan O’Hara experience and youth combined to deliver a 7-hole win against a strong Rosses Point pair and with it another Barton Shield green pennant last won at Mullingar in 2002. GoGolfing Website congratulates Jonathan Caldwell, who together with Paul Cutler (Portstewart Golf Club), Gareth Shaw (Lurgan Golf Club), Niall Kearney (The Royal Dublin Golf Club), Shane Lowry (Esker Hills Golf Club) retained the European Amateur Team Championship at Turin Heat on Saturday 5th July 2008, when they beat England in the final by 4 ½ matches to 2 ½.
gogolfing would like to congratulate Jonathan Caldwell on being, selected on the Walker Cup Team, together with Rory McIlroy of Holywood Golf Club, that was narrowly beaten (12 1/2 matches to 11 1/2 matches) by the USA at Royal Co. Down on 8th & 9th September 2007 and he was part of the victorious Irish Team that won the European Amateur Championship at Western Gailes on the Ayrshire Cost, on Saturday 7th July 2007, when they overcame a strong French team by 4 ½ matches to 2 ½ matches. Ireland had not won this Championship since 1987, the other members of the team were Rory McIlroy (Hollywood Golf Club), Shane Lowry (Esker Hills Golf Club), Richard Kilpatrick (Banbridge Golf Club), Simon Ward (Co. Louth), well done lads and we will continue to follow your progress in the years to come. The Girls’ of Clandeboye Golf Club were runners-up in the Allgrip Girls Under-19 Inter-club Finals on Tuesday 28th August 2007 at Westport Golf Club, when they beat Navan Golf Club by 2½-matches to ½-match in the morning Semi-Finals and met the girls from Mountbellew Golf Club in the afternoon decider.